Dr Guy Harvey of the Guy Harvey Ocean Foundation speaks out of behalf of the Shark-Free Marina Initiative. Hi, I’m Dr Guy Harvey. Author, conservationist, fisherman and artist. I have a message for fishermen and marinas in Florida. Join with me and Shark-Free Marinas to protect our oceans by releasing caught sharks. Our shark populations have experienced devastating declines. 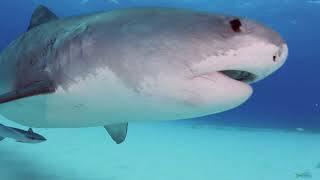 Every year in the United States, recreational fishermen kill hundreds of thousands of sharks for sport. On top of that kill tournaments and misinformed media support the antiquated concept that the only good shark is a dead shark. This negative image of sharks could not be more wrong. Sharks are guardians of the ocean and play an essential role in maintaining the healthy ocean that we fishermen enjoy. Without sharks, a productive ocean could quickly become a thing of the past. This sounds pretty bleak but there is good news. It’s not too late to reduce our impact on sharks and help threatened populations like the Dusky Shark, the Porbeagle and the Mako Shark recover to sustainable levels. By registering with the Shark-Free Marina Initiative you will take an active role in protecting sharks. Member marinas are classified as “Shark-Free” or “Shark-Friendly”. Charter fishing and locally connected businesses, like restaurants and tackle shops, are also invited to register as “Shark-Friendly”. All businesses receive the same support with free advertising, educational literature and dock signs bearing my artwork. As a fisherman you can join us by signing the “Shark-Friendly” Pledge with your commitment to release caught sharks so they will continue on contributing to a recovering population. Sharks are being killed at unprecedented and unsustainable levels. It’s now up to you as fellow fishermen and business owners to take responsibility for our oceans. My world needs sharks, our world needs sharks. Take action today and register with Shark-Free Marinas.